Tradies have been working through the week, although from the photos there doesn’t appear to have been a huge amount of work done. Mostly the pantry has now been fitted out (although the sparky tells me they will need to take some cupboards out so he can wire! ), the wiring all but done (save for that darned pantry), and the plumbing is all in (gas and water). The plasterers have also been back to finish their work, and a joiner/carpenter has been in to architrave out the new pantry door and one of the windows. 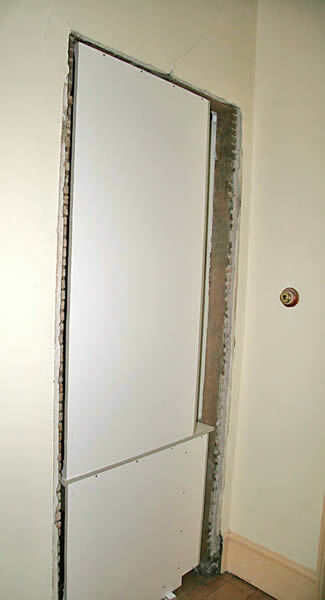 The old pantry door, with backs of shelves showing. 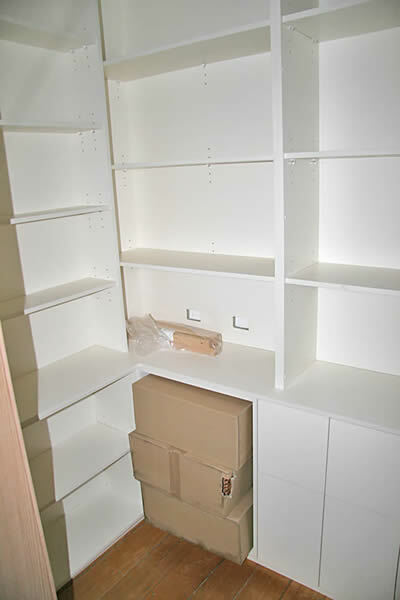 Two of the three walls of shelves in the pantry – the boxes contain wicker baskets which will eventually go in those slots. 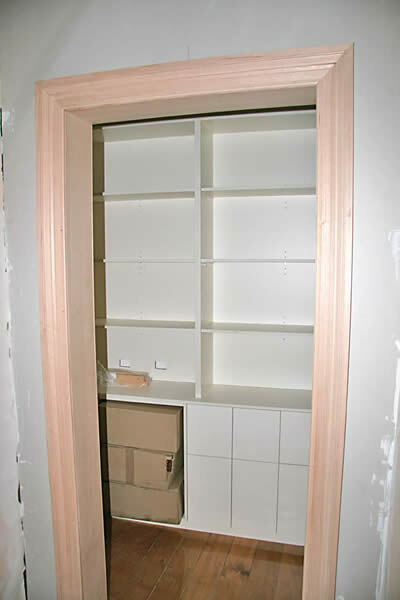 New door into pantry, all joisted/jambed and architraved out, pantry shelves in. 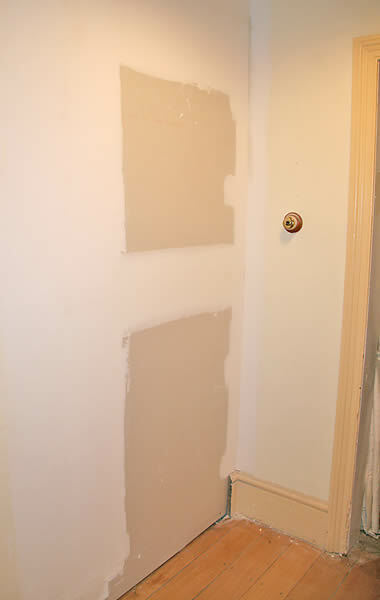 The old pantry door all plastered up! This series of photos will also show the temporary kitchen, which is mostly in the central hall of the house – washing facilities and kettle in the laundry. I will be very glad to have a kitchen back. Garden going well but as I am under the weather I am not able to do much apart from water – friends have been stopping in to do a bit of weeding for which I am very grateful. But very frustrating for me. Coming right along Sara — you must be so excited. Sara, I’ve been reading your books for about 8 years. I’m writing to let you know that I think it’s really cool how you are following your dreams and working on things that make you happy. I’ve never written an famous author before because I figure they have enough fans bothering them, but I’m happy for you and I wish you all the success and happiness in the world! It now looks like something is happening. I can’t wait to see the end of week 4. I’m glad to see it’s all coming together so nicely. I remember when we renovated our kitchen it was hell. We ate off the BBQ every night, the only interesting thing that came of that was learning what should never be BBQ’d and what was great BBQ’d. Wow it’s moving very quickly ..you must be pleased….and I totally get the gardening problems ..at least Mr 12 is watering for me ..grin ..I still haven’t dug up the spuds yet ..grin. Oh wow! I hadn’t checked up on you for a while, what progress! I’ve been collecting free road side food and cursing my kitchen as I try to process the bounty, now I’ll just imagine I’m in yours! Well, imagine what it is like having all the bounty and NO kitchen to process anything in!!!! LOL Frustration Plus.